Every part of the world has its heroes, those whose deeds have become larger than life and whose stories are passed down through the years. But if you look beneath the stories, you generally find someone who’s less a hero and more a regular person, which only makes them that much more fascinating. 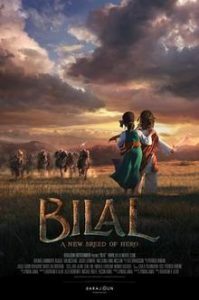 The story of Bilal ibn Rabah is one such example, and the life of one of the earliest followers of Muhammed is brought to the big screen in Bilal: Another Kind of Hero, the first animated feature film from a Dubai studio. And this is gorgeous animation, I can’t emphasize that enough. The characters’ faces do lean towards the cartoonish, faces still being notoriously difficult to animate, but they’re also individual and expressive. And every other detail is perfect, from the way the desert sun shines through a thin cloth canopy to the worn patches on a guard’s leather armor. This is a world that looks and feels as real as whatever is around you right now. In this world, Bilal (Adewale Akinnuoye-Agbaje) suffers from nightmares about the death of his mother and his and his sister Ghufaira’s (Cynthia Kaye McWilliams) subsequent fall into slavery. They grow up as the property of Umayya (Ian McShane), a wealthy and powerful man with a bully of a son called Safwan (Mick Wingert). Umayya isn’t all that great, either, but he does at least sometimes bother to learn the names of his slaves. Unable to forget the fact that he had once been free, Bilal doesn’t make the best slave — even aside from anything else, he’ll break any rule if it means helping keep his sister safe — but he forces himself to be resigned to his fate. Then he meets a mysterious man, who speaks casually but with authority about things like freedom and equality, and Bilal’s journey truly begins. As fantastic as the animation is — in one scene you can see how drops of water have dampened Bilal’s shirt — it never overshadows the story or the characters. The tale is told simply, suitable for younger viewers, but that doesn’t mean the grownups will be bored. It’s an engrossing plot driven by believable people with strengths and weaknesses. Bilal isn’t perfect, but that just makes him more inspiring as he finds his way in the world while struggling to preserve what’s left of his family. As in many historical pieces there’s a lack of female characters, but though Ghufaira is unfortunately sometimes reduced to a damsel in distress she also does help keep Bilal focused when he needs it. The battle scenes are well-done and intense though still PG, and Bilal’s transformation from rebellious teen to a man who at last knows his place in the world keeps the film grounded. With villains that hit just the right note of wickedness and a vivid supporting cast, Bilal is a vastly entertaining epic that illuminates an era not well known to many in the western world, and thoroughly charms its audience at the same time.